As Gordon and Bullock race to find the Ogre, Gotham’s deadliest killer gives Barbara an impossible choice. I’ve let Gotham fool me one too many times in this debut season. It feels like every time the story starts to go in an unexpected and interesting way, the brakes get pulled and the show goes back to the safety of the status quo. It’s all just a little too safe for me. Last week we were faced with the prospect of Barbara possibly getting involved with the Ogre’s illicit lifestyle. Considering that Barbara is an important character in Gordon’s life in the comics, it was unlikely that she’d go full-on dark side, but it would have been nice to see her take a couple of steps towards that. Instead, she immediately turned into the damsel in distress, completely undoing all of the build-up from last week in a matter of minutes. So Barbara became just another potential victim for the Ogre, even though he seemed to want her to be so much more. His protestations that he wanted her to be the one, kind of fell on deaf ears for me as we have no idea if this is the first time he’s given that speech to one of his captives. Within the space of a couple of scenes, he went from wanting Barbara to side with him to threatening to string her up from the ceiling and kill her. The one part of this I really liked was the Ogre forcing Barbara to choose somebody for him to kill. At first I thought she might pick Leslie, which would have been interesting, but choosing her parents was a great turn to take. We’ve only met her parents quite briefly once before, and they didn’t seem like very nice people at all, nonetheless, it was still an incredibly dark way to go. The Ogre ended up dead and Barbara was rescued, but we’ll have to see if all of that death will have any lasting effect on her. 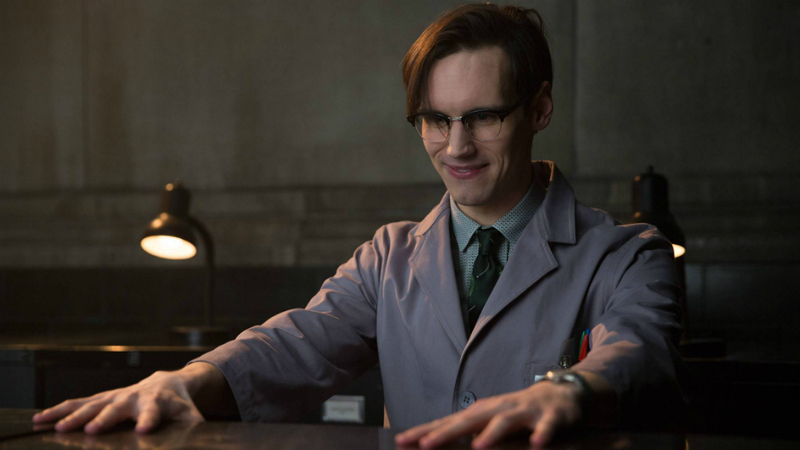 Another thing that got me excited last week was Nygma crossing the line and becoming a killer. This week he descended into cartoonish buffoonery, as he decided to bring the chopped up dead body to work with him so he could dispose of it. Please explain to me how any of that makes sense? He’s supposed to have a genius level intellect, yet he brings his murder victim to the police station. It just felt like an incredibly sloppy way of having Ms. Kringle pop in and move their side story along a little bit. At one point, she actually walked into his room and casually saw the remains of her former boyfriend. Sure, there is a reason why there would be a chopped-up dead boy in that room, but why the hell couldn’t Nygma think of a better place to get rid of it? Gotham has repeated a couple of storylines in the past already, and the Penguin material gave me a sense of deja vu. Not only did Gordon come to Penguin for help and ended up owing him another favor, now there’s a whole gang war kicking off due to lies and deceit. This does interest me, as it gives a way to tie plenty of our characters together for an action-packed finale next week, although, I’m not too convinced that they’ll pull off a satisfactory ending to the season. More intriguing at this stage is the events over at Wayne Enterprises. Bunderslaw was one step ahead of Bruce all along, and he alluded to a series of events that have been occurring for several generations in Gotham City. I kind of got a “Court of Owls” vibe from this, which would be a cool element to introduce next season. Lucius Fox made his debut too, and he appears like he’ll be an ally for Bruce going forward. Time and time again Gotham has failed to capitalize on the promise of its strongest moments. “The Anvil or the Hammer” felt like another missed opportunity to take the show out of its well established comfort zone. Barbara was saved and the Ogre vanquished, but it doesn’t feel like these events will leave any sort of lasting effect on the show. Maybe I’m wrong, and maybe this will be the foundation of a great finale, but I’m not entirely hopeful at this stage. We’ll see if this Penguin-orchestrated gang war will do anything to change my mind. What exactly do you want to see happen in the season finale? Do you want to see some shocking deaths or some great build up to next season? Tweet me @OldSnake24. Also, be sure to follow us @YouNerded!